Passover is the most Kabbalistic holiday. Everything that is written about it talks about the personal spiritual work of a person, and this I felt. Two months after I found my teacher Rabash, the Passover holiday began. I saw for the first time how serious men, who had gone through this holiday 50 to 60 or more times during their lives, became excited by the preparations for the holiday. My inner excitement was conveyed to them. I was among people who were central pillars, half of them had studied with Baal HaSulam, and I, a beginning student, didn’t understand anything. I wanted to please them somehow, so I immediately asked how it would be possible to help. They said that the oven for baking Matzot hadn’t been prepared, and for them that was the main thing. I brought a large compressor, connected it to the oven, cleaned all of the burners with compressed air and then cleaned it with an iron brush. They lit it and were very pleased. But it was small because the bricks on which the Matzot were baked were no longer usable. I brought an expert from a factory near Haifa who had very large ovens. He advised finding good stones. I did everything I could and found them, I fixed the doors and everything else. After that, I discovered that even though I understood the laws of Passover, they had their own laws, a large amount of supplements, restrictions, and many conventional restrictions that amazed me. I was told that “this is what they do and that is everything.” In general, they didn’t ask about them, but just carried them out. Everything was derived from Passover embodying the departure of a person from his ego. Moreover, this was an absolute departure, detachment and ascension to the upper world! You detach and fly to another world! So, all of the laws are built on the basis of very strict conditions. I was compelled to draw this out from them and find out. They didn’t want to tell me anything so that I wouldn’t make life difficult at home. They immediately told me that new students always overburden themselves and then “burn out” because of it. But in spite of it all, I clarified all of these laws. Understandably, at home, I didn’t act like this; that was impossible, especially with a wife and little children. In particular, because I intended to spend the holidays in Bnei Brak with the students of Rabash, I wanted to feel everything deeply myself because they carried out the instructions of Baal HaSulam, and he was strict about very severe limitations. My teacher Rav Baruch Shalom Ashlag invited me to a meal and so I saw how Passover was organized by him. After every meal, he would throw the plate, spoon and fork into a bucket. All of this would remain there until the end of Passover and would not be washed, because if a crumb of Matzo would touch water, Chametz would be created. So they washed the dishes only after the holiday and kept them until the next holiday. At the time of the meal, Rabash sat me next to him, but I felt that everything that was around me was an area forbidden to enter, a kind of fence. The eating utensils with which I ate were also placed in a separate bucket. I didn’t feel opposed to this; I understood that this was the law. This would be my acquaintance with the Passover holiday. To be honest, I “copied” all of their customs and we used them. Before Passover there was lots of work. In those days only I had a car, so I travelled with Rabash to the market to buy coffee for Passover, plates, and so forth. Besides that, he collected money for Passover all year, and before the holiday he travelled to all kinds of places and checked what he had to buy: pots, buckets, plates, and cups; everything was very simple. He loved stainless steel and glass because they were clean, and he was not familiar with and didn’t want plastic utensils. Grinders for meat and fish were also bought, which also had to be without plastic parts. In our time, it is very difficult to find meat grinders without plastic parts. Therefore I was compelled to take them apart and prepare identical parts and metal gaskets: lead, bronze and the like. Question: You didn’t have the feeling that all of these laws were excessive? Answer: No, I simply knew that our world consists of branches that come from spiritual roots, belonging to egoistic desire. Therefore, they are completely cut off and not used on Passover, and if they are used, it is in a limited manner. Suppose that it were possible to use wood, but it was not permitted to cook in it because it absorbs everything that is cooked in it. Generally, there are thousands of different restrictions. For example, eggs must be cooked from the start for the entire holiday, tomatoes, cucumbers, and garlic are not eaten. In short, besides meat and potatoes, in fact there was nothing. It was possible to use only salt from the Dead Sea. Naturally, we prepared pepper for ourselves. We bought the coffee green, sorted it, then baked it, ground it, and only then drank it. During the sorting we examined all the grains so that there would be no trace of worms. This was very difficult work. Question: Did Rabash see how difficult it was for you to select the coffee? Answer: Yes. Once he saw that I was no longer able to continue, he took a grain and said, “I sit and examine the grains because I want this grain to be clean and good, and from it my teacher can drink coffee.” Clearly, this was a very difficult lesson! But I was not ready to be involved with this for much time! A minute after the shock of his words passed, I again could not obligate myself to continue! These were not physical obstacles. If you were to take a person from the outside, or me, especially in those years when I had only just arrived in Israel, and say, “Select the coffee and you will get money in exchange for it,” I would have done this correctly and well. But this was done here to serve my teacher whom I thought was great, and specifically because of this, it was so difficult. Comment: And yet, Passover is a profoundly internal holiday that indicates detachment from the ego. Answer: The idea is that this is something that must be felt. So I was young, and also in the second and third year this had not yet penetrated inside; there was resistance, a person doesn’t want to hear or understand even though he is told. That is how many years pass until a person, under the influence of the Light, begins to listen. Small doses of Light over much time influence you and you gradually begin to understand everything. It is impossible to demand this of a new student. In the beginning, when he is still excited, he can sit and study from morning to night. But I wasn’t like that. From the start I was rigid, egoistic, and greatly resistant. Comment: In spite of it all, this is an internal holiday with efforts to reach external accommodation! You cleaned the place, you thought and worked with your ego! Answer: No. When you carry out all of these activities, you feel how loathsome they are to you and how much they are against your ego. Passover is the embodiment of a special first examination: ascent above the ego from which begins all spiritual ascent. A person feels, in contrast, when a person puts on Tefillin, wraps himself in a Tallit, and carries out other physical Mitzvot (commandments) in our world, he doesn’t feel anything. This is a Light that is too high, a high level. When you know clearly that this is Kabbalah, this is bestowal, it is possible to some degree to understand, to feel something. This is very tangible because with every action that you carry out, it is a very simple action, you are detaching the ego from yourself. Therefore, to the same degree that you want to carry everything out, you truly want to detach the ego from yourself. You clothe every physical action with a spiritual intention. Even though it has no relevance to physical actions, you attach it. Actions like this are the embodiment of a sign of spiritual intent. Therefore, it is so important and close to us. Comment: I have the sensation that in the lessons you are conveying the material about Passover through you! You don’t even let us talk to each other so that we would read and convey it through us. Answer: First of all, there isn’t enough time and you also need to absorb and prepare this, even “swallowing” it without chewing. That is why I am in a hurry. Question: When do the seven years of hunger begin? When does the cry appear in a person, “Save us and take us out!”? Answer: It is when a person feels that working on himself is useless. But it isn’t useless because it is specifically this that brings him to a recognition and understanding of his inability to succeed with his efforts and that he truly requires help through the group. But it is necessary to see all of this! The main thing is to connect the entire chain in a person: In what manner should he carry out work on the ego, how is his form changed, which changes in form is he going through and in what manner, where does Passover begin and where does it end, and what happens after Passover? Which is to say, “Passover” is detachment from the ground and departure to a higher dimension. This is a transitional level to the spiritual world that the world implements while living here together with us on this Earth. And therefore this is so important. Question: Did you feel the inner work of Rabash? Answer: With very great difficulty, with very great internal tension. We no longer travelled to the sea, or a park, anywhere. We had only one task: to prepare the eating utensils. For this we travelled to the sea, I went into the water even though it was very cold (sometimes it almost snowed on Passover) and there I immersed the eating utensils. Rabash was not really sure of a Mikvah, he used to say: “There are no questions about the sea.” The sea is water that is completely ready for the immersion of traditional dishes. Question: So what were the dishes prepared for? Answer: In itself, water symbolizes Ohr Hassadim, which purifies all kinds of Kelim. We immerse all the dishes in water, those from which we eat and also those with which we eat. Immersion by itself symbolizes their purification from the ego. Question: Was Rabash afraid of eating something that was not kosher for Passover? Answer: When I came to him, among his students there were three old men with serious problems with their teeth, like those with false teeth, Rabash’s younger brother, and Moshe Gebelstein with whom I had studied in the first months. I suggested to them that I could prepare new false teeth for them. They were so happy that toward Passover they would have completely new false teeth. Then Rabash told me, how he lost his teeth at a very young age, this happened on Passover. On Shabbat it was customary to eat fish, so on Friday, Rabash together with his student Krakovsky, the American, travelled from Jerusalem to Jericho, a place where it was possible to buy fish. When they arrived there, they bought fish, and on the way back, it became clear that their car had broken down and they were compelled to remain for Shabbat with the Arabs in a kind of caravan, a shack. In Jerusalem, frightening rumors were spread about where they might be found and they wondered where they were! What happened to them?! There was talk about losing the family of a Rav and his students! Meanwhile, they were sitting in Jericho and could not leave there and could not communicate because this was many years ago, around 1935. They remained without food. It was Passover and there was nothing to eat. In a corner stood sacks of lemons and this was the only thing that was possible to eat. Rabash said that the lemons that he ate were sweet. After that, his teeth began to hurt, the enamel began to crack. The prohibition against eating food that was not kosher was so strong! Moreover, this was Shabbat on which there is a real limitation on everything, it was impossible to pluck anything from a tree, it was impossible to do anything. Rabash told me about this when I was preparing false teeth for him. On Passover they were also accustomed to bring salt from the Dead Sea, so there was no other salt at all. There is a special mountain there from which it was possible to get relatively clean salt. Comment: You said that sometimes when you looked at Rabash, you felt that he was going through terrible states. Answer: He was very closed; therefore, in fact, it was impossible to see anything. I had already known him for many years, and in spite of it all, it was impossible to determine the spiritual states of the man. We feel the physical states because we are found in them ourselves. Therefore, analogously, it is possible to know and feel in what state a person is found. But regarding spiritual states, there is no way. Question: What does Passover symbolize for a person? Answer: This is a personal matter for a person. But the Passover that we celebrate, for those of us who want to detach from the physical ego and begin to work in the spiritual world, is the first system of communication between us and the Creator. We want to feel the spiritual world, its actions, its characteristics, its influence on us, its responses to our influence, meaning the entire system of creation, the Creator on the one hand, and on the other hand, ourselves through this system. Passover symbolizes the transition in which we leave (pass over) from a state of detachment from the Creator to a state of consciousness and contact with Him. Question: Does this mean that we put aside all that we have, intelligence, logic, and so forth? Answer: Naturally, this is a result of the influence of the Light. It is not necessary to quibble subtly; the Light simply influences the person and the person becomes different. Question: What is this desire inside of me to go out to the upper world? What is this cry within me, the exit itself? Answer: This is a given. It is given to a person when he works on himself and ascends with the help of his internal forces and means. Torah, Deuteronomy 16:01: Keep the month of spring, and make the Passover offering to the Lord, your God, for in the month of spring, the Lord, your God, brought you out of Egypt at night. Passover is a state when a person should feel that he is always coming out of Egypt. After all, every time, huge egoistic desires are revealed in him, and he tries to rise above them. We constantly come out of Egypt, little by little. We continue this way to the very end, until all uncorrected desires are exhausted. So far, we still have enough of them. From rulers of Egypt we became its slaves because we didn’t want to be Jews—united above hatred. The story of the liberation of the Hebrews from enslavement has captured the imagination of billions of people throughout history. The Exodus has come to embody man’s struggle for freedom from oppression and injustice. But there is something odd about the Exodus: The Torah commands each and every one of us to see ourselves each day as though we have just come out of Egypt. Why is this story so important? Could it be that underneath the epic tale lies a deeper, cryptic meaning? If we look into the texts of our sages throughout the ages, we will indeed find that the exodus from Egypt details a process that we as Jews went through, are going through again today, and which impacts the lives of Jews and non-Jews the world over. If we understand this process better, we will find compelling answers to many of today’s most pressing questions for the Jews, such as the essence of Judaism and why there is anti-Semitism. When Joseph’s brothers went into Egypt, they had the best life anyone could imagine. With Pharaoh’s blessing, Joseph was the de facto ruler of Egypt. “You shall be over my house, and according to your command all my people shall do homage,” Pharaoh said to Joseph. “See, I have set you over all the land of Egypt. …I am Pharaoh, yet without your permission no one shall raise his hand or foot in all the land of Egypt” (Gen 41:40-44). Under Joseph’s leadership, Egypt not only became a superpower, but also made its neighboring nations slaves to Pharaoh, taking their money, land, and flocks (Gen 47:14-19). Yet, the prime beneficiaries from Egypt’s success were the Hebrews. Knowing to whom he owed his wealth and might, Pharaoh said to Joseph: “The land of Egypt is at your disposal; settle your father and your brothers in the best of the land, let them live in the land of Goshen [the richest, most lush part of Egypt], and if you know any capable men among them, put them in charge of my livestock” (Gen 47:6). Abraham’s success drew the attention of the Babylonian king, Nimrod, who, according to the Midrash (Beresheet Rabbah 38:13), confronted Abraham and tried to prove him wrong. When King Nimrod failed, he expelled Abraham from Babylon. As the expat wandered toward the future Land of Israel, he continued to tell people about his discovery and garner followers and disciples. According to Maimonides’ Mishneh Torah (“Idolatry Rules,” Chapter 1:3), “Thousands and tens of thousands assembled around Abraham. He planted this tenet [of unity as an antidote to egoism] in their hearts, composed books about it, and taught his son, Isaac. Isaac sat and taught and informed Jacob, and appointed him a teacher, to sit and teach… And Jacob our Father taught all his sons.” By the time Joseph arrived, he had a well-established method for achieving social stability and prosperity through unity in the face of growing egoism and alienation. As we saw above, Pharaoh supported the unity of the Hebrews. He gave the best land in Egypt exclusively to them and let them cultivate their unique way of life—continuously enhancing unity—not only uninterrupted, but with his full support. Eventually, that unique unity became the essence of Judaism. As the book Yaarot Devashi (Part 2, Drush no. 2) tells us, the word “Yehudi” (Jew) comes from the word “yihudi,” meaning united. The problems began when Joseph died. Pharaoh, says the book Noam Elimelech, “is called ‘the evil inclination.’” Pharaoh is not simply egoism; he is the epitome of it. He will be nice to you only as long as you serve him. When he told Joseph, “I am Pharaoh, yet without your permission no one shall raise his hand or foot in all the land of Egypt,” he meant that Joseph would rule over Egypt because Pharaoh knows that unity pays off. Without unity, he would have no reason to give any special favor to Joseph’s kin. In other words, Pharaoh turned against us because we had abandoned our way, the way of unity above hatred, and wanted to stop being Hebrews. Throughout our history, the worst tragedies befell us when we wanted to stop being Jews and abandon the way of unity. The Greeks conquered the land of Israel because we wanted to be like them and worship the ego. We even did the fighting for them as Hellenized Jews fought against the Maccabees. Less than two centuries later, the Temple was ruined because of our unfounded hatred for each other. We were deported and murdered in Spain when we wanted to be Spaniards and abandoned our unity, and we were exterminated in Europe by the country where Jews wanted to forget about our unity and assimilate. In 1929, Dr. Kurt Fleischer, leader of the Liberals in the Berlin Jewish Community Assembly, accurately expressed our centuries’ long problem: “Anti-Semitism is the scourge that God has sent us in order to lead us together and weld us together.” What a tragedy it is that the Jews back then did not unite despite Fleischer’s truthful observation. When Moses came along, he knew that the only way to save the Hebrews was to pull them out of Egypt, out of the egoism that was destroying their relations. The book Keli Yakar (Exodus 6:2) writes about Moses: “The spirit of the Lord spoke in Pharaoh’s daughter to call him Moshe (Moses) from the word “moshech” (pulling) because he is the one who pulls Israel from exile.” That is, like Joseph before him, Moses united the people around him and thereby delivered them from Egypt. Yet, even after their exit, the Hebrews were in danger of falling back into egoism. They received their “signet” as a nation only when they reenacted Abraham’s method of uniting above hatred. Once they pledged to unite “as one man with one heart,” they were declared a “nation.” At the foot of Mt. Sinai, from the word “sinaa” (hatred), the Hebrews united and thereby covered their hatred with love. 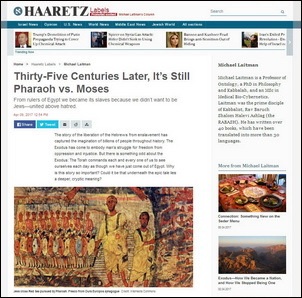 As we read the Haggadah, it is a good idea to keep in mind that Pharaoh, Joseph, Moses, and all the other characters are more than parts of our history. We are commanded to remember the exodus from Egypt every day because they are actually parts of us! We all have Pharaoh, the evil inclination, but we do not have within us enough Moses and Joseph, the forces of unity. We are arrogant, self-entitled, and egoistic to the point of narcissism. We have lost our Jewishness, our tendency to unite. In consequence, just as the Egyptians turned against the Hebrews when they abandoned Joseph’s way, the world is turning against us today because of our disunity. We will not find solutions to anti-Semitism in suppressing anti-Semitic tirades. This will not uproot the hate. As The Book of Consciousness writes in the quote just mentioned, “You see, my son, all the dangers and all the miracles and tragedies are all from you, because of you, and on account of you.” Our disunity creates, feeds, and fans the flames of anti-Semitism. When Abraham found his way to overcome egoism, he wanted to share it with everyone. Likewise, as soon as the Hebrews became a nation, they were tasked with being “a light unto nations.” Put differently, they were commanded to bring unity to the world and complete what Abraham had begun. But in order to accomplish this, we must first exit our internal Egypt—the rule of the Pharaoh within us—and choose the way of Joseph and Moses, the way of unity. Moses knew what Abraham had wanted to achieve and tried to do the same. Ramchal wrote in his commentary on the Torah that “Moses wished to complete the correction of the world at that time. However, he did not succeed because of the corruptions that occurred along the way.” So, at the end of the day, being Jewish means following the path of Abraham and Moses—the path of unity, mutual responsibility, and brotherhood. When we seek unity, we are Jews. When we seek other goals, we are not. Passover is the festival of freedom. Yet, we cannot be free as long as we are slaves to our egos. Liberation from Pharaoh means freedom from the evil inclination: the desire to harm, patronize, and oppress others. We are far from it. As long as we remain this way, we must not expect anti-Semitism to subside. On the contrary, it will only grow because, as I said above, our egoism creates, feeds, and fans it. If we want to celebrate a proper Seder, we must put our priorities in the right order: our unity comes first, and everything else follows. We may disagree on politics, LGBT issues, Israel, or family matters. But if we do not unite above all our disagreements then we are wrong regardless of our position. Just as a mother loves her children regardless of their traits, beliefs, and actions, we must find a way to at least begin to march toward each other. This will be the beginning of our liberation from the inner Pharaoh. This year, as we discuss the story of our ancestors, let’s also think about the ancestors within us, the forces of egoism or connection and brotherhood—to which of them we are catering, and to which of them we should be catering. I wish us all a happy and kosher (hatred free) Passover. Question: On the one hand, a person cannot get rid of his egoistic nature—the upper force carries this out. On the other hand, you say that a person is not given something that he is unable to do. Answer: A person, as in mathematics, is given a condition that this is impossible yet necessary. Here, a natural question arises: “How?” If we cannot do anything yet the correction is compulsory, then it is impossible to avoid it either. The solution is to use the wisdom of Kabbalah to attract the force that would change us, instead of us changing ourselves! For this reason, Kabbalah was given to humanity. Certainly, we are not able to exit our egoistic nature that forces us to think only of ourselves and of no one else. Whether we do so subconsciously or consciously, this is still the only thing that exists in us. However, we can attract upon ourselves a special force called the Torah, or the upper Light, the property of love and bestowal, that will transform us. Today we are beginning to see from our own mistakes that we, like dogs, are chasing our own tails, unable to do anything with ourselves and the world. We can only raise our hands and surrender ourselves to the mercy of the flow of evolution: Whatever happens, happens. Judging by the number of people suffering from depression, drug use, and all other parameters, a larger portion of humanity is beginning to realize that it is in a state of despair. And now something must be done. The only solution is for us to raise above ourselves. This can only be done with the help of the upper force. The wisdom of Kabbalah is the method for revealing it. When everyone realizes that this is the only way out of a dead end, we will succeed. How Can We Get To Know The Creator? In the News (Reuters): “The Israeli government voted on Sunday in favor of decriminalizing recreational marijuana use, joining some U.S. states and European countries who have adopted a similar approach. “’On the one hand we are opening ourselves up to the future. On the other hand, we understand the dangers and will try to balance the two,’ Prime Minister Benjamin Netanyahu told his cabinet in broadcast remarks. “According to the new policy, which must still be ratified by parliament, people caught smoking marijuana would be fined rather than arrested and prosecuted. Criminal procedures would be launched only against those caught repeatedly with the drug. Question: Will people gradually stop smoking and kick this habit as a result? Answer: I don’t see this. This is possible only if they receive such internal satisfaction that they will not need these things. Question: What do you think brings a person to smoke more? Is it the pain he feels because everything around him is pressuring him or is it because he wants to receive pleasure? Answer: Many factors are involved here. A person is pressured by both pleasure and lack of pleasure. Besides, the forbidden fruit is much sweeter. If it isn’t forbidden any more, we can do something about it. What do we do about smoking? A serious widespread campaign all over the world has brought the decline in the number of cigarette smokers. In the past, it was common to smoke on the streets , and today you can hardly see anyone doing that. Question: Does that mean that you think we can cope with marijuana smoking? Answer: Everything will gradually go back to the way it was. We just have to do it correctly. Question: Sometimes even the most non-religious people have a sensation as if some higher power is protecting them, helping them come out unharmed from the most dangerous situations. But then there are very difficult states when it feels as if we were forgotten above or that no higher power has ever protected us to begin with. Modern person believes less and less in protection from above. Does it really exist? Answer: We don’t just have protection from above, but in general, we exist in this world as if an embryo in the mother’s womb, that is, within a system, binding us along all parameters and leaving us without any freedom. The system doesn’t allow us to make a single independent movement: neither physical, nor spiritual, nor mental, or emotional. Everything is bound with steel cords into a strict system, and it is impossible to think about any kind of freedom in any sense of the word. This force, binding us with thousands of connections, is hidden from us and that is why it seems to us that we are free and able to do anything we want. Our future, our actions, and the general system’s reactions to them are all covered by the darkness of the unknown. Why would nature hide all this from us? In order for us to discover for ourselves the system within which we exist, to study, feel, and understand it to such a degree that we become a seamless integral part of it, in one awareness, desire, sensation with it. This is man’s predestination and the goal of his existence in this world.